Chan, Arlene. "Chinese Immigration Act". The Canadian Encyclopedia, 20 June 2017, Historica Canada. https://www.thecanadianencyclopedia.ca/en/article/chinese-immigration-act. Accessed 21 April 2019. The Chinese Immigration Act of 1923, known also as the Chinese Exclusion Act, banned the entry of virtually all Chinese immigrants for 24 years. Although migration into Canada from most countries was controlled or restricted in some way, only Chinese people were singled out completely from entering on the basis of race. The four exceptions to the exclusion were students, merchants (excluding laundry, restaurant and retail operators), diplomats and Canadian-born Chinese returning from education in China. The limit on absence from Canada was two years, and the consequence for not returning on time was being barred re-entry. Additionally, every person of Chinese descent, whether Canadian-born or naturalized, was required to register for an identity card within 12 months. The penalty for noncompliance was imprisonment or a fine of up to $500. Though the Act was repealed in 1947, immigration restrictions on the basis of race and national origin were not fully scrubbed until 1967. 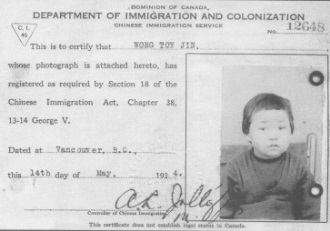 Identification card issued on 14 May 1924, for three-year-old Wong Toy Jin in compliance with one-year deadline for registration of all Canadian-born and naturalized Chinese residents. The anti-Chinese movement took root after the first wave of Chinese immigrants began arriving in British Columbia for the gold rush of 1858. The second major Chinese influx to the province came as labourers for the construction of the Canadian Pacific Railway (1881–85), a labour force much needed for the development of Western Canada but not desirable as citizens for a “White Canada forever.” This popular phrase among politicians and the media was derived from the White Canada policy laid down in the Immigration Act of 1910. While the act did not name any racial or ethnic groups, it did allow for the restriction of “immigrants belonging to any race deemed unsuited to the climate or requirements of Canada,” the ethnic basis for Canadian immigration policy until 1967 (see Prejudice and Discrimination). 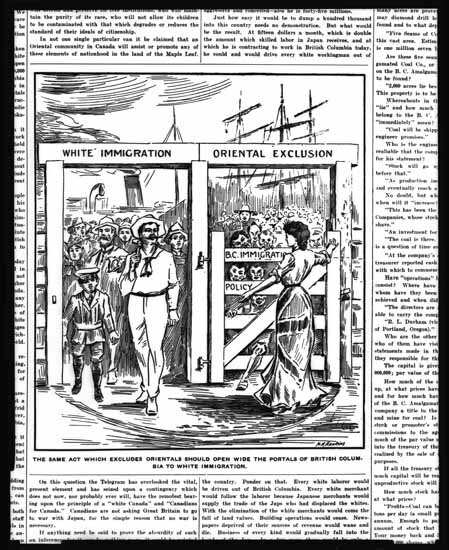 Political cartoon from the Saturday Sunset, 24 August 1907, with the caption, "The same act which excludes orientals should open the portals of British Columbia to white immigration." After the completion of the CPR, agitation against the “yellow peril” gathered momentum, resulting in over 100 provincial laws and policies that restricted the rights of Chinese residents. (The “yellow peril” reference to Chinese and Japanese people originated in the late 1800s after they arrived as labourers in the United States and Canada; it expressed Western prejudice towards East Asian immigrants.) The Canadian government’s most racist and exclusionary law, however, was the Chinese Immigration Act of 1885. Under that law, a $50 head tax was levied on all Chinese immigrants. The head tax was increased to $100 in 1900 and to $500 in 1903. It became clear that this punitive entry fee did not discourage Chinese immigration, as intended. The Chinese population tripled during the head-tax era, from 13,000 in 1885 to 39,587 in 1921. A harsher solution was required: exclusion. On 1 July 1923, Dominion Day, now called Canada Day, the Chinese Immigration Act, a new law with the same name, was passed. The Chinese in Canada referred to this day as “Humiliation Day” and refused to join in its celebrations for many years. From the government’s point of view, the Chinese Immigration Act was an overwhelming success. During the exclusionary period, fewer than 50 Chinese immigrants were allowed entry. The population decreased by 25 per cent, from 39,587 in 1921 to 32,528 by 1951. Not only did the law ban Chinese immigration, it also intentionally disrupted family life and stunted community growth. 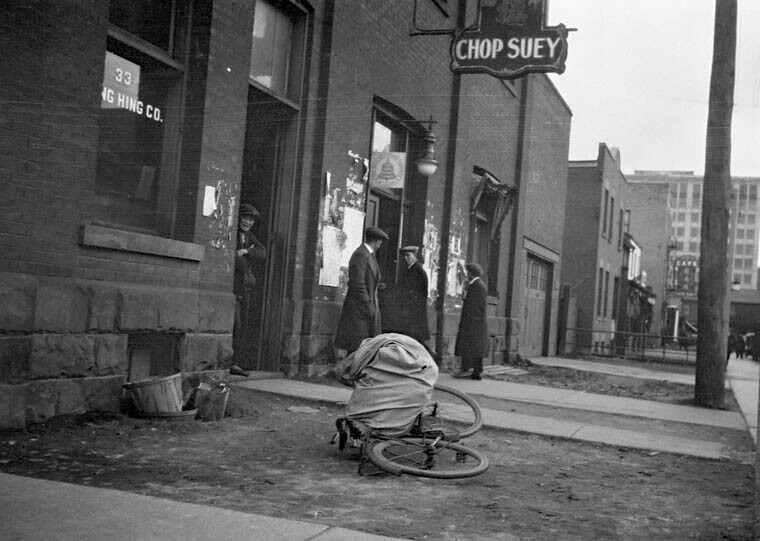 Bachelor society in Toronto's Chinatown, 1923. In 1941 there were 29,033 Chinese men in Canada, over 80 per cent of whom were married with wives and children left behind in China. Enduring this family separation, these “married bachelors” lived alone. A mere handful had the financial means to make a trip to China a few times during the exclusionary years to either marry or visit their wives and children. Whether or not they were Canadian-born or naturalized, they were not allowed to sponsor family members to join them in Canada. With the absence of family life, the Chinese community found support through their traditional associations, not only for socialization and relaxation, but also for financial aid, banking services, social services and employment and housing assistance. These organizations, some of the membership of which was based on shared surnames, some on common place of origin, provided a haven for the bachelor society. At the onset of the Chinese Immigration Act, prejudice and discrimination were already well entrenched. Chinese people were reduced to second-class status as an inferior race (see Racism). Legislation barred them from the right to vote, to hold public office or to own property, limited employment and housing and imposed many other restrictions. Protests from White workers and labour unions hampered their ability to earn a living. Still burdened by paying off debts incurred by the head tax, they also earned lower wages. Bearing such harsh conditions, Chinese people retreated into small businesses such as laundries, restaurants and grocery stores. Employment as cooks and servants, domestic work that was undesirable to White workers due to the low pay and social status, was also willingly endured rather than the alternative of returning to China and sacrificing the earnings that supported their families there. The urgency to earn money for families in China was so great that desperate times called for desperate solutions. An illegal immigration scheme gathered momentum from the head-tax era, one that arranged for people, mostly males, to come to Canada with fraudulent papers claiming false identities. These “paper sons” adopted new surnames, then came under the identity of someone who was entitled to return to Canada but did not. The price was high, not only for the cost of the fake identity, but also the subsequent years of living in fear of being deported back to China and keeping secret their real names, even from their descendants. The Great Depression (1929–39) added an additional layer of hardship. The Chinese unemployment rate soared as high as 80 per cent in Vancouver, a sharp contrast to the city’s overall jobless rate of 30.2 per cent in 1931. Loss of face was a deeply entrenched cultural value and a hindrance to seeking help outside of their community. Although most Chinese people turned to their traditional associations for financial assistance, those who had to rely on the government received less money than expected. Relief payments of $1.12 per week to Chinese people in Alberta, as an example, were less than half of what was given to other Albertans. News from China did not bring any comfort during the exclusionary years. Civil wars pitted the ruling Nationalist Party (Guomindang) against military warlords and rising Communist forces. Beyond these internal conflicts were external threats from Japan, starting with small-scale incidents that escalated to the outbreak of the Sino-Japanese War in 1937 and the occupation of China. The flow of letters and remittances (money sent home) was interrupted, particularly after the Japanese captured Hong Kong, a major communication hub between China and North America. The safety and well-being of family members in China was unknown. The declaration of war against Japan in 1941 was another tipping point. Canada and China were now allied, fighting together against a common enemy. The military policy of barring Chinese recruits was reversed in 1944 in an amendment to the National Resources Mobilization Act of 1940. An estimated 600 Chinese people, including several women, enlisted in all three branches of the Canadian Armed Forces. The war’s end in 1945 brought lessening hostility, favourable media coverage and growing esteem for the Chinese community’s war effort in military service, fundraising and Victory Loan drives. Politicians, labour unions and war veterans joined church leaders in demanding the Canadian government repeal its anti-Chinese legislation. 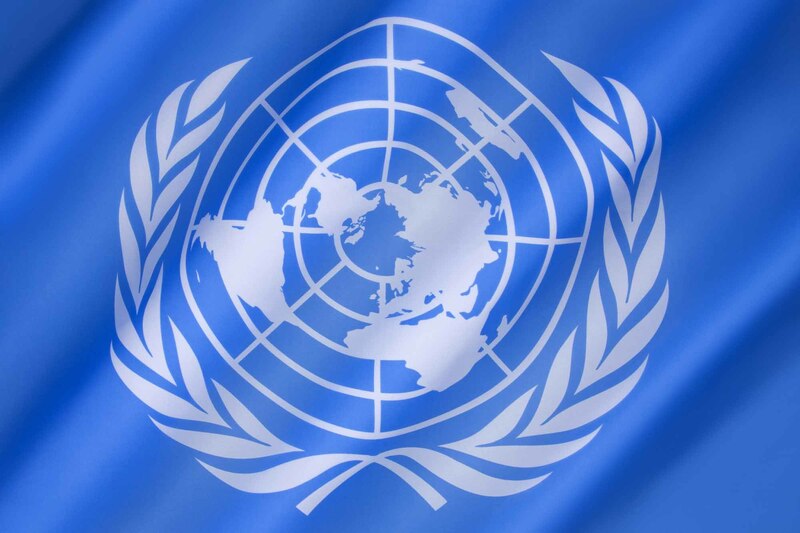 An additional pressure point in 1945 was the United Nations’ Charter of Human Rights and subsequent Universal Declaration of Human Rights. Canada, as a signatory country, contravened these new universal rights with its anti-Chinese policies. In 1947, Canada repealed the Chinese Immigration Act. As much as the language of exclusion was removed, Chinese immigrants were still treated inequitably due to Order-in-Council, P.C. 2115. This order stipulated that entrance was limited to only spouses and children (under the age of 18) of Canadian citizens at a time when only 8 per cent of Chinese-born residents were naturalized citizens. For other immigrants, there were no such restrictions. Delegations of Chinese and non-Chinese individuals made annual visits to Ottawa to lobby for an immigration policy that would ease family reunification. Men in the bachelor society who dreamed of bringing their families to Canada were largely disappointed for another 20 years. In 1967, immigration restrictions on the basis of race and national origin were finally removed. Chinese immigrants could now apply for entry on equal footing with other applicants. Nationwide campaigns lobbied the federal government for over 20 years to apologize for the injustices of its past anti-Chinese immigration policies. On 22 June 2006, Prime Minister Stephen Harper formally apologized for the head tax (1885–1923) and exclusionary legislation (1923–47). Symbolic payments were made to surviving head-tax payers and to the spouses of deceased payers. 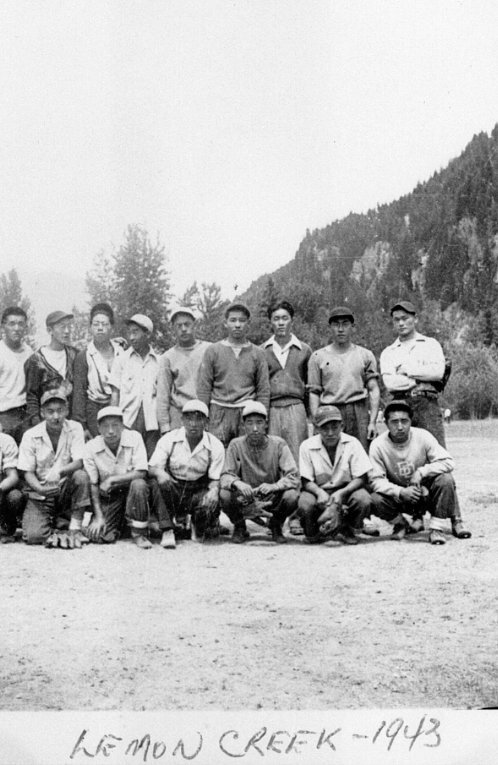 A community fund was designated for projects to commemorate and educate Canadians about the past injustices endured by the Chinese Canadian community. An apology by Christy Clark, premier of British Columbia, followed on 15 May 2014, and a $1 million legacy fund was promised for educational initiatives. The Chinese Immigration Act successfully halted the influx of Chinese immigrants into Canada and severely restricted economic, social and community development for 24 years. After the Second World War, the repeal of this discriminatory legislation, the gaining of the right to vote and the establishment of the Canadian Citizenship Act in 1947 were the first steps to increased and more equitable inclusion into Canadian life. 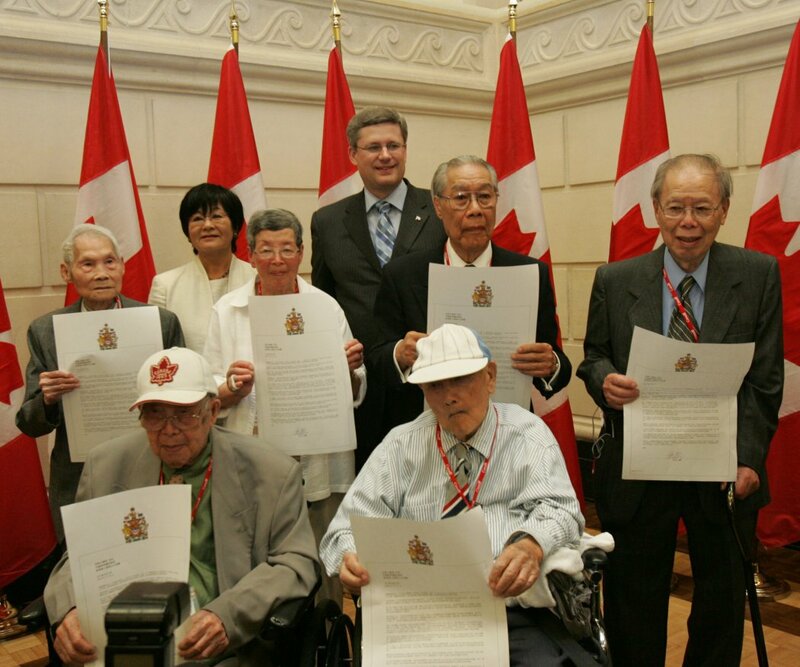 The Chinese in Canada could now assume their rightful place as valued Canadian citizens.